Orac Decor’s segmented columns are manufactured from a durable polyurethane blend which provides great strength and impact resistance to the columns. The segmented columns are impervious to moistures and can be used as indoor and outdoor columns in a number of different environments. These vertical column segments are also very lightweight, unlike traditional stone or wood columns, and can be easily installed with everyday wood working tools. The segmented full columns from Orac Decor come in four pieces for our customers convenience. Orac Decor produces the segmented columns in state-of-the-art steel molds that ensure perfectly sculpted details in every piece. The segmented columns are factory primed and can be stained, finished, or painted to meet you design needs. Outwater stocks the segmented columns, along with the entire Orac Decor collection, in our Arizona and New Jersey facilities. This allows us to provide faster and more cost-effective shipping to our customers on both the East and West coast. If you’re having trouble finding the segmented column to meet your needs, contact our knowledgeable sales department for more information on these products and our free material sample program. Orac Decor High Density Polyurethane Segmented Half Column, Primed White. 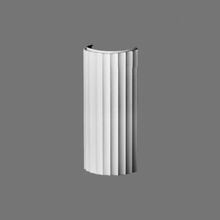 Width: 13-3/4", Height: 28-3/8"
Orac Decor High Density Polyurethane Segmented Full Column, Primed White. Width: 13-3/4", Height: 28-3/8"